Seriously, how could you resist buying cookies from this girl? We had a very busy Saturday of soccer games, Girl Scout cookie booth selling and a birthday party to finish the day with! 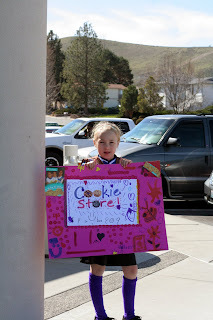 They did a great job selling cookies. Jayde is quite the sales person!